1 Tuner + 1 or more non-Tuner monsters. Whenever you would take damage from a card effect, place 1 Black Feather Counter on this card instead. This card loses 700 ATK for each Black Feather Counter on..
Activate only when exactly 1 "Blackwing" monster is Special Summoned, by selecting 1 face-up monster your opponent controls. Gain Life Points equal to the ATK of that monster, and return it to the ha.. 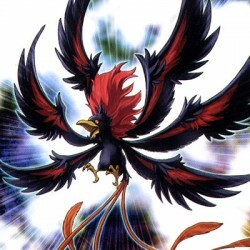 If you control a face-up "Blackwing" monster, you can Normal Summon this card without Tributes. When this card is Normal Summoned successfully, you can change the Battle Position of 1 monster your opp.. This card can attack your opponent directly. When this card attacks your opponent directly and inflicts battle damage to your opponent, change 1 Attack Position monster your opponent controls to Defen.. If you control no cards, you can Special Summon this card from your hand. While this card is face-up on the field, if your opponent's monster attacks a "Blackwing" monster you control, the attacking m..
1 "Blackwing" Tuner Monster + 2 or more non-Tuner monsters. When this card is Synchro Summoned, you can select and destroy up to 2 face-up monsters on the field with DEF lower than this card's ATK. Yo.. If this card is in the Graveyard, you can return 1 face-up card you control to the hand to Special Summon this card from your Graveyard, and take 400 damage. Each player can only use the effect of "Bl..
1 "Blackwing" Tuner + 1 or more Non-Tuner monsters. If this card attacks a Defense Position monster, it gains 500 ATK during the Damage Step only. During battle between this attacking card and a Defen.. Select 1 face-up monster you control. Until the End Phase, it loses 500 ATK and during battle between that attacking monster and a Defense position monster whose DEF is lower than the selected monster.. Send 1 "Blackwing" monster from your hand to the Graveyard and select 1 Normal Trap Card in your opponent's Graveyard. The effect of this card will be the same as the selected Normal Trap Card. ..